This method of connecting to a projector is called Component Progressive and involves using a regular Gen 3 3D Theater, a 3D friendly DVD player and a DLP Projector. Step #1 Connect a component video wire (RBG red blue green) from the DVD player directly to the Projector. Step #2 Connect a composite video wire (Normal Video Wire) from the DVD player directly to the Gen 3 3D Theater(In the end if you are not getting a solid red signal from the 3D Sync box you will need to use the black split video wire that comes with the unit and run it to any regular video input). Step #3 Go to the on screen Menu of the DVD player and change the setting to 480p. 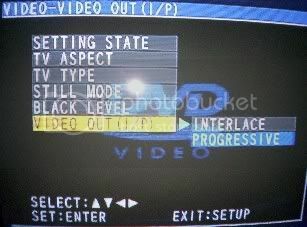 For the Specific DVD player model Panasonic DVD-S1 press setup on the remote and then toggle down to video press enter then toggle down to video out and select progressive. Also change the setting of the TV type to projection. Step #4 Plug in the glasses or get your wireless 3D glasses ready, put in a 3D DVD sit back relax and get ready for the 3D experience of a lifetime. A Gen 3 3D Theater (This item is currently only being manufactured by Ultimate3DHeaven although old stock from other companies does still exist) which is an advanced 3D theater that can support 15 wired glasses and 15 wireless glasses at the same time. If more glasses are needed you can simply wire another Gen 3 3D Theater in line (or more) and add in an additional 15 wired glasses and 15 wireless glasses for each additional 3D theater with the special split video wire included with the 3D unit. A 3D friendly progressive DVD player. Currently we have found a few models that are progressive 3D Compatible. A few of the model numbers above can be found for less than $50 new or around $15 used on the Internet.